When I get an invite, email or press release for a new plus size clothing line, my heart skips a beat. I like having options of where to shop and what to wear. When I was a teenager, the choices where I could shop were extremely limited. After many, many years of only shopping at maybe 2-3 retailers, I get very excited to have another option. Today I want to introduce and give you yet another option. Harper & Liv is coming this May to Dillard's and online. Its a new modern contemporary collection ranging from $39 - $129. The collection will have bottoms, dresses, jeans, casual and a few evening pieces. To me this collection is a bridge between really young jr. plus and mature collection. I think you will like it and will find something everyone. I was invited to luncheon in NYC for a first look at this new plus size collection. Although I couldn't attend, the nice people from Harper + Liv sent me these pics to share and give you a first look. Since I am jeans girl, I am loving these distressed and patchwork denim. 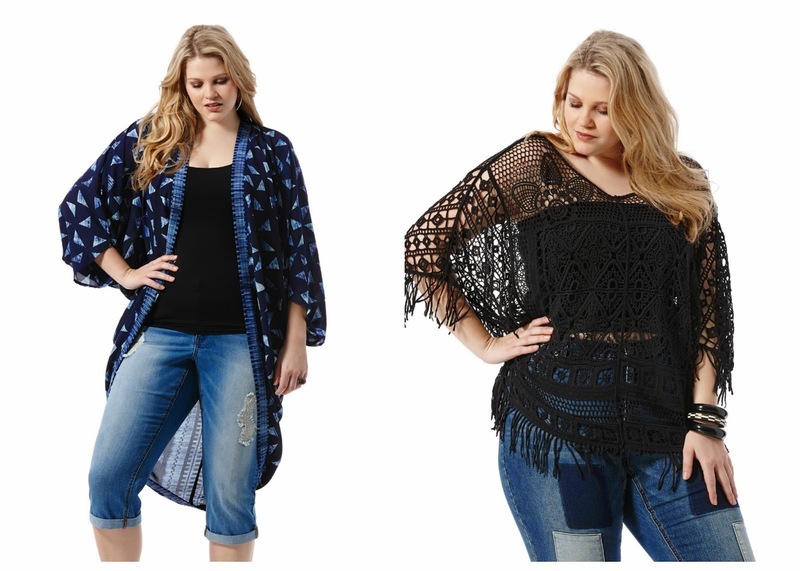 The kimono and crochet ponchos are on trend with a boho vibe. I would totally wear both these outfits. Would you? There are plenty of prints as well in the new Harper + Liv line. These pants are very cute and I want to add them to my comfy pant collection! The prints continue with skirts and added details. These skirts can easily be worn for many occasions. I even see an office appropriate outfit with a blazer. You will also see dressier or evening options like this LBD (little black dress) with an embossed print. I love the style and length, not too short or long. This dress would make a cute outfit to celebrate my 20:20 birthday, don't you think? Like what you see so far? To learn more about Harper + Liv collection you can go to the website or find them on instagram too. I'll have some outfits to share soon when the line launches in May. Let me know what you think of this new plus size line in the comments. Oooh! I'm really loving those palm print pants. I need those palm tree pants in my life! Do you need to hire essay writer? best site for students who need help in dissertation writing. Visit my website to receive essay writing help for money. Your blog is filled with unique good articles! I was impressed how well you express your thoughts and sharing your experiences. I bet the contributor is a professional in the domain. As contrasted with the numerous works I've browsed on the problem, the one is rich in modern solutions. The web site regularly puts a world of exciting researches on the live matters. Can A Shoe Transform Your Outfit and Your Life?